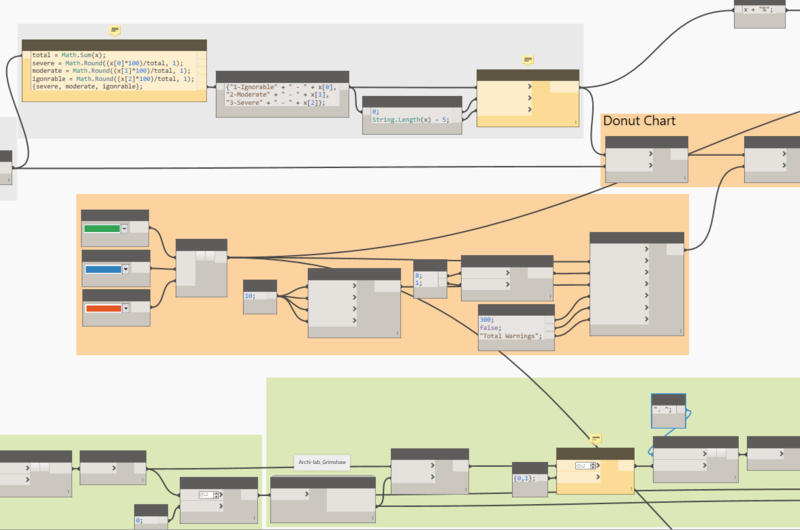 Now, to produce that complete “report”, it would be a really long explanation, so I will let you guys fill in the blanks and instead just cover the initial data processing of the HTML Warning file that Revit outputs, introduce all of the new nodes for Dynamo and show you what they do. Let’s start at the beginning and that is what are the warnings and how to get hold of them. While working in Revit, we will occasionally manage to produce a warning. Those things are only slightly annoying, as they are usually pop up windows with some ambiguous message, and an OK button that allows us to dismiss them and just keep going. Even though it looks like they are gone, they are not. Revit stores them in the file, and that can have some consequences in the long run. Why? Because now, when you open your file these warnings need to be re-instantiated, and that can not only slow it down, but also potentially cause issues. I personally, prefer to keep the warnings at a minimum, and do some checkups throughout the life of a project. Some warnings are easily fixable, and some are a little more involved. 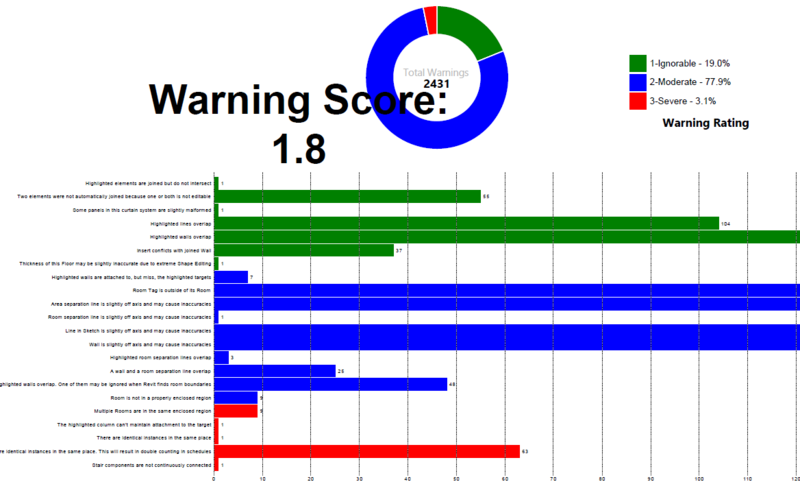 That’s why I also like to rate my warnings on a scale of 1-3, with 1 being ignorable and 3 severe. Now, the issue with Revit API is that it doesn’t provide any access to these warnings programmatically. One has to use the user interface, and export them to an HTML file, but even that is not very well thought out, as some of the naming conventions in Revit clash with HTML encoding, causing some weird looking tables. Anyways, we won’t get into that. Let’s have a look at how we can access these warnings, once we have them exported to HTML. I am not showing you results here on purpose. This HTML file was generated at work, and I don’t have the file with me at home. My results are all null, but you get the idea. Also, all of these nodes are part of the Archi-lab package. As you can see some warnings have Design Option information, but some don’t. That’s because if a warning was generated by somehow misusing the design option functionality, it will have that Design Option info listed. Others were not, and for those we might only have things like Workset, Category or Type. Also keep in mind that for things like annotation, the Workset value returned is usually a View that such annotation resides in since they are view based and do not actually exist in Worksets. It’s important to make sure that the CSV file has headers and these two columns in it. It takes the list of True/False boolean mask and searches out index values for all True items. That way we can use those to replace all elements in the original list. This file is dependant on UI++, Archi-lab and Mandrill packages. Please let me know if something is not clear, and I will try and help out. Cheers! Remember that like I have said in the comments, these are in some cases templates, so they won’t contain a warning message exactly like one you might encounter in your HTML report. This is great Konrad. Thanks for sharing! 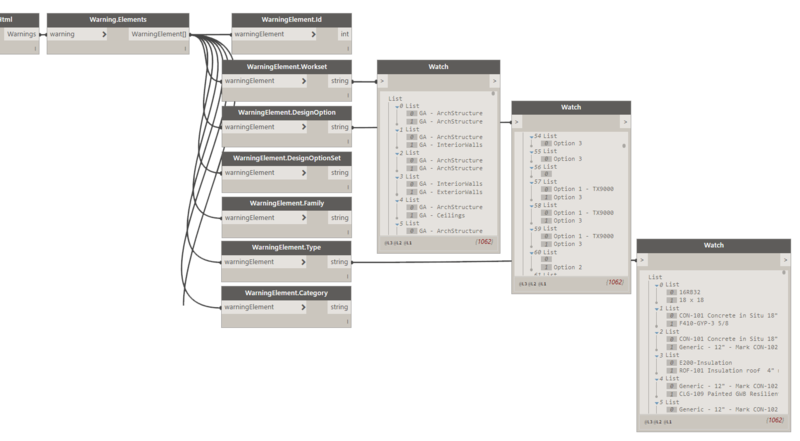 2 questions; is there a list somewhere of all the possible warnings Revit generates from which you created your CSV file, and are you creating the graph at the top of the post in Dynamo or just using Excel? There is a way to obtain such list, but you don’t want it. Why? Because that list is just a template. Each warning is generated individually by passing it through that template. What that means is warnings list stored internally by Revit has blanks in it that are filled by actual elements when they are posting a warning. It makes it not very usable for this purpose. Also, its 900+ warnings long, and you will not see even 10th of that on a average project. If you still want to see it, i will save that thing out to Excel and send it to you. Even better, just make a new post on Dynamo Forum and i will reply there with Python code to get that. The graph/report that is posted on top of the post is created using these new warning parsing nodes from Archi-lab and Mandrill package. Just download the sample file and you should be able to get the same thing. Of course you will need a different warning rating library as you are likely to get more/different warnings. I’d be interested in an example of getting a list of all the possible warnings in Revit. Looking forward to your post on how to get them. Please see the post above. I have made posted the code you are asking for. I see what you’re getting at now. So, do you think the workflow would be to export the warnings, go through them in Excel to generate the ratings, and then use these as a CSV to run in Dynamo? I had hoped to be able to generate a single CSV file to apply to all projects in advance. It now looks like that the CSV file will/may grow over time. Good to know. I used your Python code to write a macro in C#. It worked out great. I have also made an attempt to triage through various warnings and shared it at RTC2014. 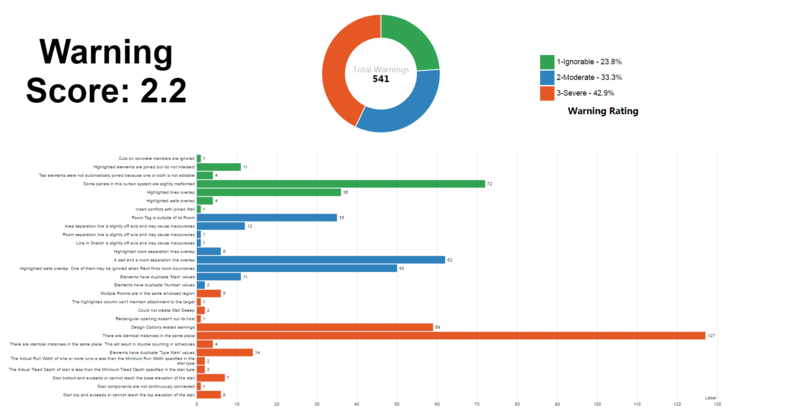 At that time, there was no API to warnings, and instead of using dynamo, I have used Excel Pivot tables to triage the warnings from the HTM report. Thanks for sharing! This is great stuff. Great work with the Mandrill / D3.js stuff. Quick question on the “create names that will be displayed when hover over a donut chart slice.” group. Are the ratings listed in different order between the first and second code blocks? Looks like perhaps I made a mistake. Thanks for catching it! Next step to become the perfect Model manager would be to check warnings from a list of models (filepaths) _without actually opening the whole file… You would then get a fairly honest routine to check the health of models company wide. I have been looking at nodes to get informations from a model without opening it, and all I could find was in the Bakery nodes: “Get Build Number from All RVTs in a Folder” for example. Do you think this can be achieved? Well you will be able to fully automate this routine as soon as Revit 2018 comes out. Currently there is no way to extract warnings out of the file other than manually exporting them to an HTML report. I intend to update this method as soon as 2018 API is out. Is there an easy way to find the most comment MEP revit warnings to create a csv file from? Not that I know of. I am sorry. Also i ran this dynamo script using your csv file but one of my own HTML warning files and i received the below errors on nodes. I’m relatively new to dynamo and could use some guidance as to what is going wrong? I didn’t manage to structure my Warning Library. If you could help me out I would appreciate it. I am sorry, but unfortunately I don’t have means of recreating an error like that since I work in English and not french. I can’t help here. Please try the forum: https://forum.dynamobim.com and if someone with the same language settings can help that would be great. Cheers! Thanks Konrad, amazing way of quickly sorting the warnings of our projects. 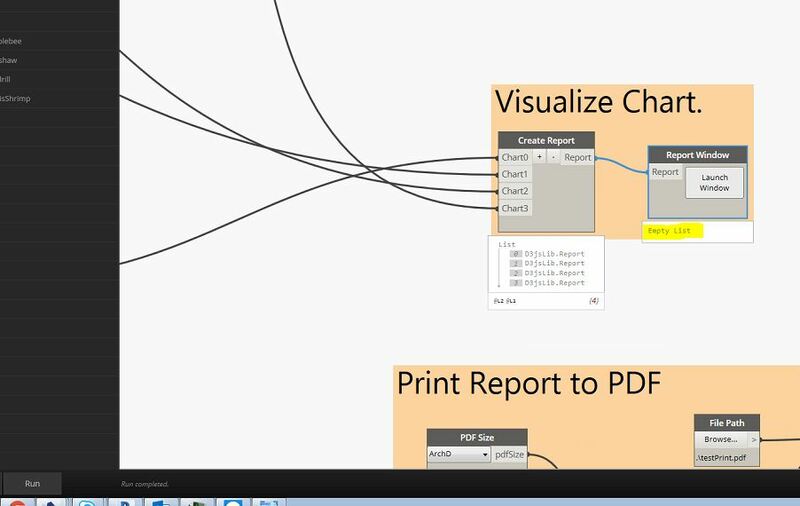 I have tested it on Revit 2016 with Dynamo 1.2.1 and it works perfectly. But I am trying to use it with Revit 2017.2 and my dynamo is crashing. It is not a big issue because I can always use 2016, but is kind of an extra step opening both versions. Do you know what might be the issue? it runs ok without errors but I have the final node “Report Window ” as empty! Did you try hitting the Launch Window button? I don’t think there will be any output on that last node if that’s what you are looking for. Hi Konrad, this is great! thanks for sharing. I am new to Dynamo and I having trouble with the warning parsing. All my chart style nodes show a warning: “the input types are not matching”. Do you know what I am doing wrong? Could it be my list of colors? Never mind. It work! Thanks! I couldn’t get the CSV file to work. Revit warnings contain comma’s in the warning text. And that corrupts the CSV. Using ” ” also did not work. So I changed the *.CSV to *.TXT as input file for the WarningLibrary.WarningLibraryFromCsv node. And it worked. Very happy with this. Also thanks to Troy for his long list to use. Ok. Too fast too soon. I’m very interested in your approach and I’m developing something similar. I was wondering that if you can share with me that model that gave three types of warnings severity as I want to try something like this. Sorry, but I can’t share Revit models here, since they don’t belong to me. They belong to my previous employer. You can sure create your own warnings though. They are easy to come by. Hi Konrad been using your warning parsing script since 2017 and had no problems in 2018. In 2019 I get the error attached. I receive the warning attached in my List.GetItemAtIndex node. In addition to this anytime I try to print PDF I crash. 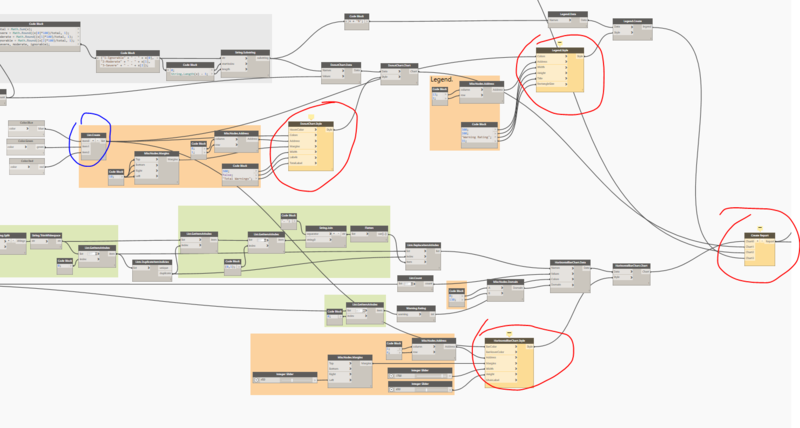 Can you offer any insight as to why this might be happening I have been experiencing broken scripts in 2019 with dynamo version 2.0.2. I can forward the script if you would like best. You posted that exact same comment before to my Portfolio page. I responded there too. I will need a minimal reproducible sample file. I can’t help if I can’t re-create this.